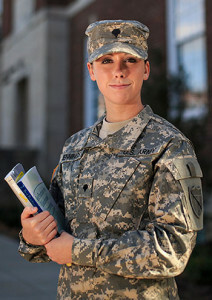 Home › FAQ › Can You Get College Credit for Military Experience? If you’re currently serving in the military or you’ve recently left the armed forces in pursuit of higher education, then you may be wondering if you can receive college credit for military experience. The short answer is yes, but there are some caveats that you need to keep in mind before registering for classes. Schools are making it increasingly easier for service members and veterans to streamline their degrees. The key is choosing the right college and major for your experience. The American Council on Education or ACE collaborates with the Department of Defense to help service members achieve their educational goals. Since the 1950s, the ACE has been helping members of the armed forces go to school. They offer course credit guidance, career assessments and other information to active and veteran military members in an effort to help them acclimate to the world of higher education. Keep in mind, however, that you may only receive general education credit for your experience. Advocacy groups are working to gain better acceptance among schools for military experience, but it’s an ongoing process. One of their services includes “quality assurance and policy guidance” for the Joint Services Transcript or JST, which is a document used by all branches of the military to keep track of a service member’s training record. Once you leave the military, you can obtain your JST. This document lists what you’ve done during your military career and how this experience might be applied toward a college degree. The ACE certifies that your service transcript complies with certain educational standards and that certain aspects should be considered transferable credit depending on the college course. It’s up to the school whether you’ll receive credit for specific courses, but about 2,300 schools throughout the country accept the JST as sufficient proof. Aside from the JST, you can receive college credit for military experience by taking proficiency exams or submitting a portfolio of your work and training. Many schools offer all students the option to take the College Level Examination Program or CLEP. The CLEP allows students to take proficiency tests in up to 33 subject areas. As a veteran, you also have this right, and your previous experiences may allow you to score high enough on CLEP tests that you can forgo many lower-division courses. Also, military members and their family may also be eligible to take CLEP tests for free. Other schools in the country offer their own testing options that award credit for proficiency. You could also submit a detailed portfolio to a specific school or program. The portfolio would need to include your service record, a narrative of your experience, explanations of what you learned and other pertinent information. It’s at the school’s discretion whether to award credit for testing and portfolios. Transitioning into civilian life once you leave the military can be daunting, especially when it comes to higher education. Many schools throughout the U.S. have adopted programs that are specifically designed to make the transition easier for veterans. There area variety of challenges that the average student faces, but veterans and active service members in particular will need to become their own advocates in securing college credit for military experience. Additional reading: What is Involved in a Transfer Admission For College?